In addition to the flat-track motorcycle racing we love, there are plenty of infield activities that make the day fun for everyone in attendance. This will be the first time in more than 15 years, that the AMA Pro Flat Track races are returning to OKC! We’ll be ready when the OKC Mile speeds into town at the newly renovated Remington Park on June 18. That’s right — just in time for Father’s Day! Dads, bring your kids (or kids, bring your dads) to the OKC Mile for a jam-packed event your whole family will enjoy. There’ll be activities on the infield, a strider course for kids, and over-the-top entertainment for adults (like photo ops with trophy girls!). You will want to book your tickets now to make sure you can make it. We’re expecting record numbers of attendees, so if you want the best seats, reserve yours now. 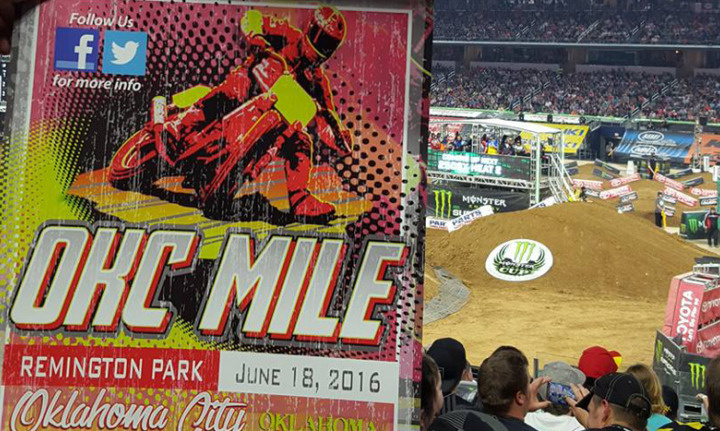 Don’t miss your chance to attend the largest motorsports event ever to happen in Oklahoma. Help us put OKC back on the map of professional dirt track racing, and buy your tickets today! General Admission is still available! View the entire event schedule and times below.